Aluminum oxide finished flooring, it sounds scary and harmful, but really, it’s both very safe and durable! If you are looking for a floor that is safe and has great durability, aluminum oxide finish should be your top choice. In fact, aluminum oxide pre-finished wood floors are the most preferred floors today. That’s because flooring with an aluminum oxide finish has a hard, scratch resistant layer and is often well-tolerated, even by chemically sensitive people. Aluminum oxide is a naturally occurring element, a chemical compound of aluminum and oxygen in a crystal form. Aluminum oxide in its natural crystal form occurs as ruby and sapphire gemstones. But more commonly, it’s used as an abrasive for sandpaper and to produce aluminum metal. Once it’s ground up, the powder is used as an additive to water-based urethane finishes. The ground up aluminum oxide is designed to add a hard, durable, scratch resistant layer to flooring. The finish penetrates the upper layers of the wood, which not only enhances the grain, but resists scratching from normal use. Typically, the number of coats of aluminum oxide will range from 5-10 layers for most flooring products. One extra perk is the finish will guard against oxidization and seals the board’s top surface. It’s almost like an additional shield to the wood. 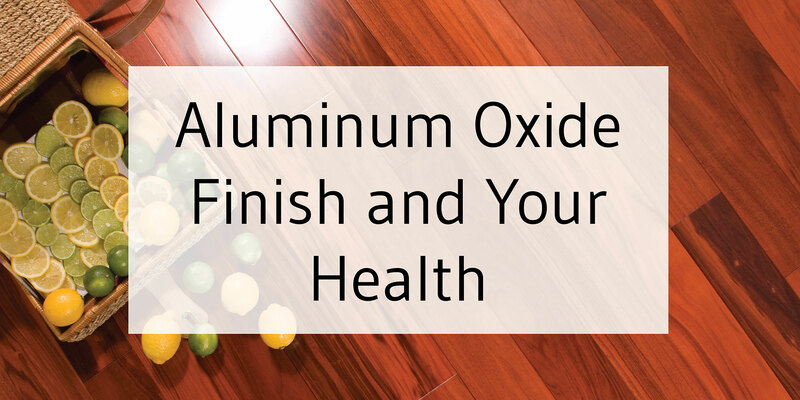 An aluminum oxide finish will really help protect your floor from everyday use over the years. Off-gassing is always a big concern with engineered flooring. Pre-finished aluminum oxide floors are actually quite safe in terms of off-gassing, in that they don’t really off-gas! One benefit of buying a pre-finished aluminum oxide finished floor is that it’s very durable because they boards are UV-cured, or baked at the mill. Site-finished floors are a different story; they can off-gas and have a weaker scratch resistant layer because they aren’t UV-cured at the mill. Re-finishing an aluminum oxide finished floor on site can be difficult, as with all floors, between the dust and fumes. However, because aluminum oxide finish is so durable, it’s less likely that re-finishing will be necessary, especially if the floor is maintained. Tesoro Woods recommends spot re-touching if possible because it’s much safer and less expensive than re-finishing. See our care and maintenance page for full instructions on cleaning and maintaining your floor.